Above is the measurement, the screen is not readable, but it is 852nH, very close to the estimated 850nH. The poster’s report which was accepted by the gathered experts is clearly not supported by a very simple experiment to measure a small single turn loop with both conductors bonded at the ends, there is no cancellation and the pair of wires do behave similarly to a single round wire of the same GMR. What if the wires were series connected. The Cat 5 pair was rewired with the end of the blue wire connected to the start of the white, and the inductance measured between the remaining ends. Above is the changed configuration. 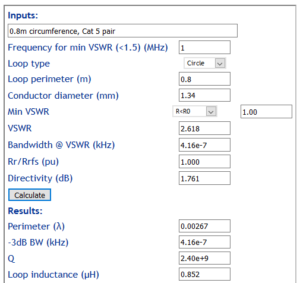 Inductance measured 3190nH, not quite four times that of the parallel connection. 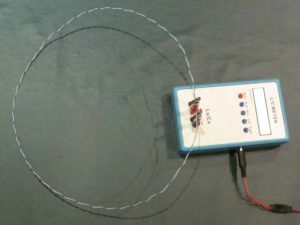 An estimate of a single turn of 0.5mm diameter conductor is 1010nH, and two turns with no flux leakage would have an inductance of four times that or 4040nH. The measured value of 3190nH suggests there is a little flux leakage, to be expected as there is flux in the 0.4mm radial space around one conductor which does not cut the other conductor. 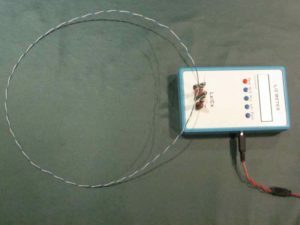 Of course if you connected the turns series opposing (bond the blue and white at one end of the pair and measure inductance between the two wires at the other end, you would expect to measure very low inductance and the flux nearly cancels, nearly again due to flux leakage. But who would be so naive to try to use such a connection for an antenna? 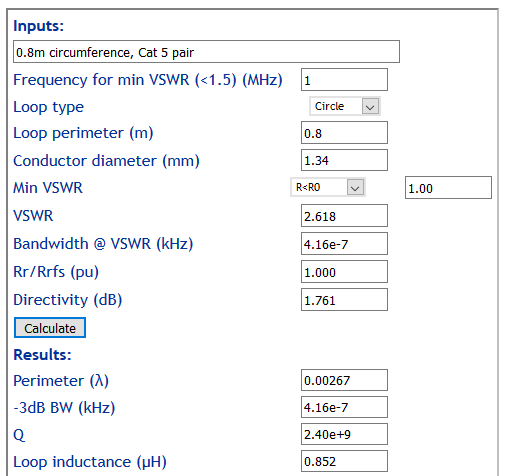 The experiments do not support the online experts report that a loop of Cat 5 pair has low inductance because of cancellation, if the conductors are paralleled they behave much like a single round conductor of same GMR, and if they are series connected, the inductance is a little less than n^2 times the inductance of a single turn as a result of flux leakage. No mysteries, just really basic electromagnetism and a 2 minute experiment which the online expert clearly did not perform to validate his thinking.